The Arena War update suggests there's a lot of potential left in the game. Whenever I log in to GTA Online, I'm almost overwhelmed by the amount of stuff I remember I can do in the game. I forget that I bought an Avenger, one of GTA's flying fortresses, where a dude will add cool things to my cars for a price. I have a hangar, a motorcycle club, a nightclub, a facility for the Doomsday heist, countless ludicrous vehicles and now, an Arena Workshop. I like how busy it feels, and how much extra stuff you can accumulate in Online that regular GTA 5 just never had—if I was 18 right now with nothing but time on my hands and a few friends who love GTA as much as me, I'd play this non-stop. It's a GTA game you can play forever. 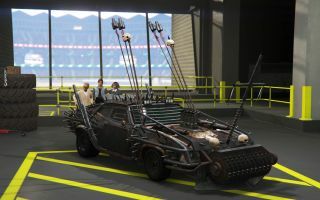 Any time a novelty weapon or vehicle gets added to GTA Online, I am here for it. Who knows? Maybe in a year I'll be writing about portal guns or something. I wonder what Trevor Phillips would make of the Up-n-Atomizer. GTA's numerous free cash giveaways have given people a nice excuse to jump back into the game across the last year. It's how I was able to easily afford an Arena Workshop and the weapon above, having not picked up the game as much since the After Hours update. From Rockstar's perspective, it probably acts a good incentive to get new and lapsed players to give GTA a try, and for me it's a comfortable way to keep up with the game's major updates without buying Shark Cards. The recent Arena War update is like GTA Online's version of a themed minigame compilation, focusing on vehicle combat. Taking place in the Maze Bank Arena, it's been doling out generous double experience/cash rewards since it launched. The modes aren't all winners, but a few of them are terrific fun to jump into: Hot Bomb tasks you with passing the imminently-exploding bomb to other players by crashing into them, and it's a laugh. Games Masters has one team racing through checkpoints while the opposition blows them up with drones, turrets and other explosive goodies from the sidelines. Then, you switch roles. What Sam described as GTA Online's version of Rocket League isn't quite that, unfortunately—Bomb Ball is about knocking a whole bunch of ball-shaped bombs into the other players' half (and sometimes the goal), but it's a bit too busy and incoherent to be as enjoyable as it could be. I'd love to try a version of this with just one big bomb, though, to see what Rocket League in GTA would really be like. I've come to regard playing GTA Online's PvP modes as seasonal: I play them for as long as the bonuses last, basically, when I can be guaranteed to find other players who want to give it a go. With Arena War, though, there's a separate point system for unlockables that could potentially support new modes for months to come. That's pretty exciting: I like the arena as a change of scenery, and vehicle combat remains as appealing as ever in GTA. GTA Online's 2019 is hard to figure out. Arena War launched pretty soon after Red Dead Online became publicly available on consoles, which suggests some confidence by Rockstar that they can co-exist. That was something I wondered about after reading this interview quote about GTA updates from Rockstar's director of design Imran Sarwar, speaking to Game Informer in 2017. "We don't yet have a fixed end point in mind, but the rollout of updates may change a little in order to encourage players to try Red Dead Redemption 2 when it launches. It would be great to have players splitting time between two incredible worlds, but we shall see how things evolve." GTA's peak players on Steam—so, not including those who bought the game from resellers or Rockstar itself—is at a healthy 120,000+ for the last 30 days. On consoles where GTA's player base is enormous, I have no idea, but Red Dead Online offers something very different to GTA in pace and tone. I think they can co-exist: it makes a massive difference to me when GTA Online gets a new radio station or new NPCs, or a novel update like nightclubs that offer an excuse for a bunch of fun cameos and new ways to interact with friends. They make this city feel like it's still living, over five years after I first explored it on 360. Not all the content is for me—I've never been much of a racing guy in GTA—but there's so much here that I can go uncover hours' worth of other stuff instead. My guess is that 2017's Doomsday Heist was the last big story-based co-op content that'll be added to the game, and that 2019 will focus on packages of PvP modes in the way that Arena War does. But I'm also hoping something a little different, in the vein of nightclubs, will arrive in the middle of this year—somewhere new to hang out, maybe, or a different angle on the way GTA traditionally plays. What's left for GTA Online to focus on? The long-anticipated casino, or naval warfare? Hell, I'll run my own beauty salon in Los Santos if given the chance. If GTA Online can keep expanding until whenever the next instalment lands on PC—which is probably so many years away it makes my hair grey just thinking about it—that'll suit me just fine.